It’s hard to turn down free money for a public park, but directors of Miami’s Downtown Development Authority declined last week to back a conservancy – which has $7.5 million in pledges, though it’s not officially formed yet – for Museum Park until management details with Bayfront Park can be worked out. Museum Park, formerly Bicentennial Park and home to the Perez Art Museum Miami and the under-construction Patricia and Phillip Frost Museum of Science, adjoins the larger Bayfront Park, which now controls both parcels. The authority’s board readily acknowledged that the latter, managed by the Bayfront Park Trust and Executive Director Tim Schmand, has been extraordinarily successful despite budget constraints. Its $1.85 million budget was slashed to $585,000 in fiscal 2007-08, but the park was able to recruit events that have not only kept it afloat but allowed money to be allocated to operations and maintenance. Mr. Schmand told authority directors that 96% of the park is open. A notable exception is the Ultra Music Festival, held in March at Bayfront – not Museum – park. “Whether you like the music or not, Ultra has done more to bring Miami’s brand around that planet than anything,” he said. The festival is attended by thousands and viewed by millions around the world. In a letter to Alyce Robertson, authority executive director, Mr. Schmand said that Museum Park has been closed for only one day since its opening, when the E-Race electric car competition was run. Other events are restricted to portions of the 22.5-acre park, while most areas remain open. Advocates for Museum Park presented the conservancy proposal to the authority last month, saying that Museum Park has been neglected for 30 years. The Miami and Knight foundations have laid the groundwork for the conservancy, which is to be a public-private partnership. The plan is to transform the park into a lushly landscaped space with performance area, a playground, shade and water features, and room for waterfront dining options. If the Miami commission approves next year, the conservancy would manage Museum Park but the city would still own it. Friends of Museum Park, an ancillary group, would raise funds to support and maintain it. 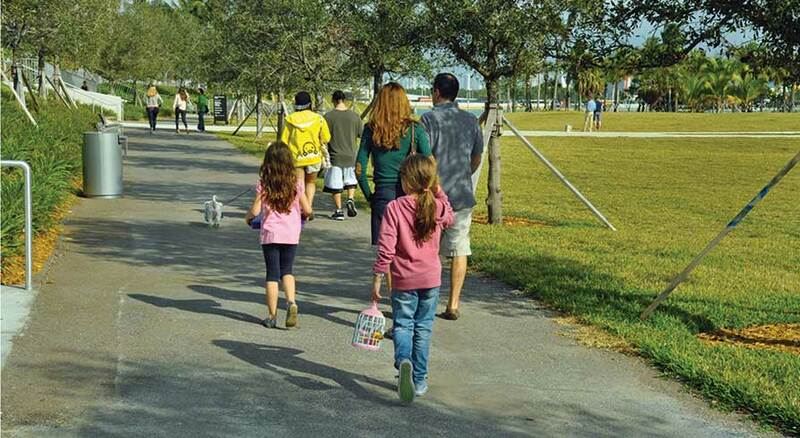 For the first 18 months, the conservancy would concentrate on raising funds, while management of both facilities would remain with Bayfront Park. Then there would be a transition “after which we would partner with the trust. We’re hopeful that we can negotiate an agreement that spells it out clearly,” Mr. Soto said. “There’s a missing piece,” said authority vice chairman Neisen Kasdin, who is office-managing shareholder of the Akerman law firm. “Clearly there are some bruised feelings.” While he praised the conservancy model, which has been successful for New York City’s Central Park and Chicago’s Millennium Park, he said there is also value in “the quality of management Tim brings.” He suggested management of both parks remain with Bayfront for five years. Board member Bruno Barreiro, who is a Miami-Dade County commissioner, asked why the conservancy model is so successful at fundraising. In the end, the board agreed with Mr. Kasdin’s suggestion that the authority, Miami Foundation and Bayfront Park Trust engage within 30 days in a “vigorous, full and open discussion,” of their roles if a conservancy is formed. Directors said they hope the matter will come back before the development authority board within 60 days.